The viscosity number that you see on a bottle of motor oil can tell you how well the oil performs at certain temperatures. A lower viscosity is better suited for colder temperatures while a higher viscosity is better suited for warm temperatures. In many cases, one bottle of oil provides protection at both hot and cold temperatures. Let's say that the bottle says 5W-30 on it. This means that the viscosity is five when the engine is cold and 30 when the engine is warm. Ultimately, it helps to keep engine parts properly lubricated whether the car is being driven or if it is at rest. At KIA Downtown Los Angeles, we can help you find the right type of motor oil for your car or truck. 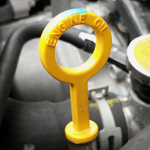 This will ensure that your engine is properly protected, which can avoid major damage and a potentially expensive repair bill.